The social media campaign against racism that grew after Dani Alves ate a banana thrown onto the pitch was planned in advance by team-mate Neymar. Barcelona's Alves took a bite before a corner in Sunday's win at Villarreal. Afterwards, Neymar posted a picture of himself on social media with a banana and the hashtag "we are all monkeys". The cause was taken up worldwide but a Brazilian advertising agency says the response was planned to help Neymar counter racism in Spain. Neymar and Alves have been racially abused by fans a number of times this season. 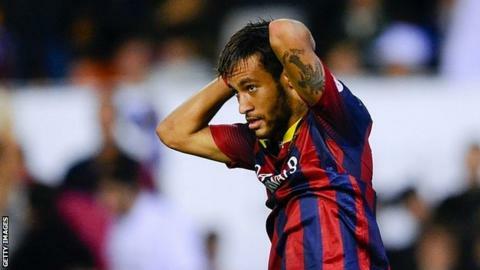 Monkey chants aimed at Neymar after a recent game against Espanyol prompted the Brazilian to seek help from his father and advisers on the best course of action. "Neymar didn't want to be quiet, he wanted to use his own powerful voice to create something to talk about racism," said Guga Ketzer, partner at Brazilian agency Loducca. "We created this idea with the hashtag 'we are all monkeys' and the idea was to use it and take a picture of him eating a banana." When Alves, who knew nothing of the plan, peeled the fruit and took a bite against Villareal, Neymar's campaign was launched. He posted a picture of himself and his child eating bananas on Instagram, prompting a number of other players, celebrities and politicians to emulate him. "It was the best way to empower and start this conversation in Brazil," Ketzer told BBC Sport. "It is to prove to the racists that we are all together - whether we are black, white, yellow, it doesn't matter. We are all monkeys. Our idea was to make the racist powerless. It is one of the biggest racist conversations in years in Brazil and even in the world." Brazilian TV presenter Luciano Huck, a friend of Neymar's, caused controversy when his clothing company began selling T-shirts featuring a picture of a banana and the same hashtag. Ketzer insists his agency is not connected to Huck. "This not a marketing campaign, it's just a way for Neymar to engage his audience and express his anger and his hate against the racism in the the world," added Ketzer. Spanish police arrested the 26-year-old fan responsible for throwing the banana, while Villareal banned him for life. Reports in the Spanish media suggest the fan was a youth coach at the club but Villareal have not commented. "If I could, I would put a photo of the fan on the internet so that he would be shamed," said Alves, 30. He also criticised Spain for its approach to racism, saying: "They sell the country as being first world but in certain things they are very backward."